How Has the Definition of a ‘Treat’ Changed for Today’s Children? We all have sweet childhood memories about treats. I remember when I was a child I always spent Saturday evening at my grandma’s house. She had a sweet jar behind the television. She always gave me two little hard candies, only two, but that just made my day. The world changes so fast. Nowadays, there are shops everywhere and treat foods are available and affordable. With increased accessibility and frequency, you may wonder if a treat is still a ‘real’ treat for today’s children. Very recently, a scientific study published in the journal Appetite mapped adults’ treat food provision to children. This study surveyed over 1,000 adults, including not only parents, but also grandparents, school and pre-school teachers, and private child minders; almost everyone involved in child rearing, to answer the question what is considered a treat for today’s children? What is a treat to children from adults’ perspectives? So what is a treat? According to the dictionary, a treat is “an event or item that is out of the ordinary and gives great pleasure”. This definition mentions two key elements: low frequency and pleasure. According to the study, adults’ definition of treats for children is slightly different. 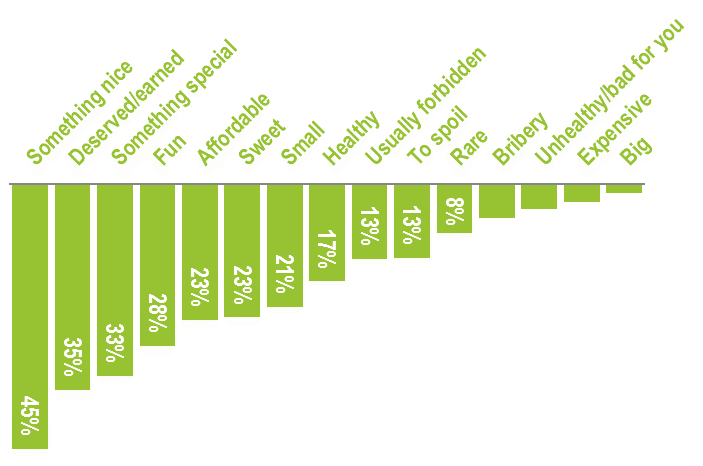 They think treats for children are primarily something ‘nice’ (45.2%), ‘deserved/earned’ (35.1%) and ‘special’ (32.7%). 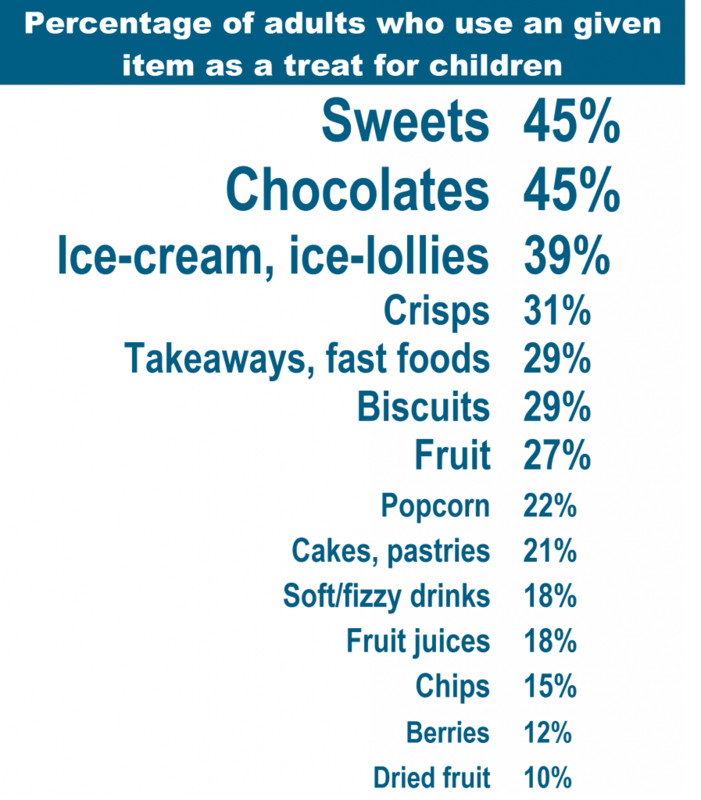 It is worth noting that 17% of adults think that treats for children must be ‘healthy’. When do adults give treat foods to children? The study shows that nearly all adults (92.0%) would provide treat foods to children at celebrations. Just think about those celebrative occasions, Easter, Halloween, Christmas, birthdays, weddings, the last day of school, the end of a sports season, the anniversary of a pet joining the family… the list goes on. It is easy to imagine that the totality of all these occasions can be huge for some children. Therefore, as some scholars suggest, the health impact of treat foods consumed at celebration should be well recognised. In addition, around two thirds of the adults, especially parents, have routinized daily or weekly treat foods for children. It could be after-school treats, after-dinner treats, Friday treats, weekend treats and so on. Adults also provide treats for some particular reasons (see the figure below). 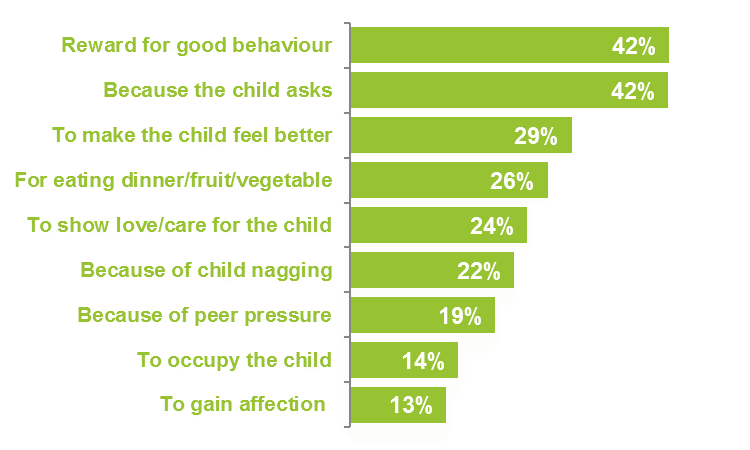 Rewarding good behaviour and child’s requests are the two biggest triggers. What kind of foods do adults use as treats for children? In general, adults’ treat foods for children are dominated by less healthy options that come to mind when thinking of the word ‘treat’. Sweets, chocolates, and ice cream/ice lollies are the most popular treats. In comparison, some healthy foods including fruits, fruit juice, berries, and dried fruit are less likely used as treats for children. For today’s children, treat foods have become normalised into their lives and are frequently included in their diets. It is not the same treat that previous generations would think of when they hear the word. It would be naïve to think, in modern society, that the use of treat foods can be avoided or dramatically reduced. Thus children related public health initiatives should not ignore treat foods. The popularity of ‘unhealthy’ foods as treats for children echoes a trend for indulgence observed at the IFT’s Food Expo: in some situations, consumers are not willing to give up the sensory pleasure for healthy purposes. Treat food occasions are such situations where for parents, and other child care providers, indulgence is more important than health concerns. Can a healthier alternative to sweets and chocolate become as appealing a treat to children? This is a good question that food innovators can possibly address. Since treat frequency seems to be increasing, it becomes more important to produce healthy treats to improve the health of children. This can include incorporating fruit and vegetable servings into treats, marketing healthier foods with a ‘treat’ perspective to improve perception of these foods, and reducing total calories and sugar in treat foods. Christine is a Kerry Group Newman Fellowship Scholar based in University College Dublin (UCD). She describes herself as an ‘international’ citizen with multi-discipline backgrounds. She was born in China and completed her first Master degree in Biochemistry. She then gained her Science Communication degree in the Netherlands, and her PhD in Public Health and Consumer Science at UCD. She is currently mainly working on the EU-China-Safe project.